Should I Upgrade to a Vinyl Fence? If you’re thinking about getting a new fence, you should make sure to consider all your options. Most people only think about getting a new wood fence, since that’s what they’re familiar with and what their neighbors have. However, upgrading to a vinyl fence could be a much better decision for you and your home. Find out if now is the right time for you to upgrade to a vinyl fence. Fresh Appearance – With a vinyl fence, your home and property get a fresh, updated look that won’t go away over time. Vinyl is a durable, modern fencing material, and it will continue to look clean and new for many years. Wood fence, on the other hand, will weather and break down over time. Less Maintenance – Wooden fences require painting, staining, and other maintenance to stay strong. Vinyl fence doesn’t. In fact, vinyl fence is virtually maintenance free. You don’t need to stain it, seal it, or protect it in any way from the elements – and even without any special upkeep it will still last far longer than a wood fence. Longer Lifespan – Vinyl fence is built to last. When you get a vinyl fence for your home, you get a fence that can literally last as long as the home it surrounds. Because vinyl doesn’t rot, become brittle, or break down over time, it’s possible to get a fence that you’ll never need to replace. More Strength – Along with being the most durable type of fence, vinyl fences are also the strongest at standing up to damage and abuse. Vinyl’s natural flexibility helps it shrug off impacts and pressure that would damage a wooden fence. It’s also lighter and more temperature-stable than wood, so it won’t sag, lean, or swell and contract with temperature changes. With all the advantages of vinyl fencing over wood, you’re probably wondering how to tell when you should upgrade. In general, wood fences last about a decade, with cedar lasting a little longer than pine and other soft woods. If yours is getting close to that age, you should consider upgrading to a new fence. Keeping an old fence around past that age can lead to additional problems as the wood rots and degrades. In some cases you might notice signs of damage such as leaning, sagging, or rot even before the usual decade is up. When this happens you can choose to repair your wood fence instead of replacing it – but upgrading might still be a better choice. When you repair large sections of your fence you’re just prolonging the inevitable. You also could end up with a fence that looks half-new and half-weathered, which is never a good look. Finally, you may want to think about upgrading to vinyl when you’re planning to sell your home. A vinyl fence is a major upgrade in terms of home value and curb appeal. It will improve the overall look of your home, and you can use vinyl’s advantages as selling points to help your home stand out. Also, remember that you don’t need to wait for summer to upgrade your fence. At Future Outdoors we can install fence any time during the year, even in winter. If you want to upgrade to a vinyl fence, contact us today at Future Outdoors. 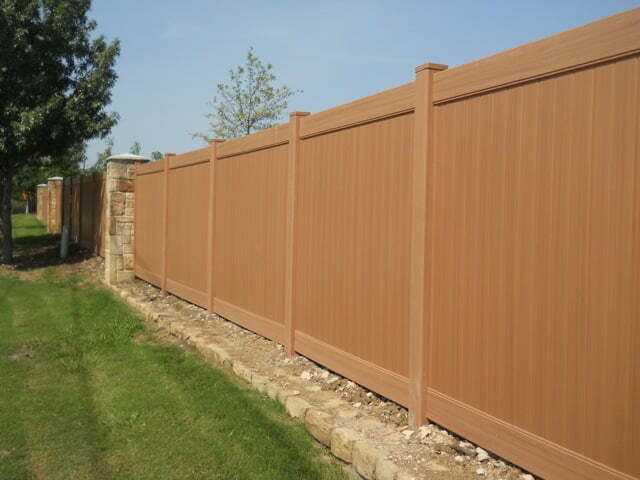 We’re the most experienced vinyl fence contractor in the DFW area, and we have decades of experience with installing and designing vinyl fences. We also have the best selection of colors, styles, and accessories, so you can get exactly the fence you want at the best price. Call Future Outdoors today at 972-576-1600 to learn more about our vinyl fence options and to schedule your free consultation. You can also take a look at our Facebook page to see completed projects and learn more about us!